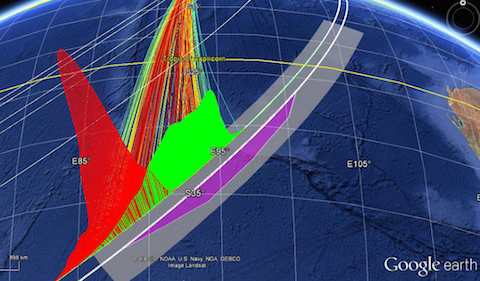 On 8 October 2014, the Australian Transport Safety Bureau (ATSB) released an update detailing their best estimate of the current location of Malaysia Airlines Flight MH370. The location of this 777, which went missing on 8 March 2014 with 227 passengers and 12 crew members who were on board, is unknown, and in the seven months since the aircraft went missing, no trace of the aircraft, its passengers, or its cargo have been found. In spite of this lack of direct, physical evidence, information from other sources, including radar data and signals sent from the aircraft to an INMARSAT satellite, were used to estimate both the duration of flight for the aircraft, and its approximate position when the aircraft presumably ran out of fuel over the southern Indian Ocean. The last satellite communication occurred very near the estimated time of fuel exhaustion. The ATSB, Boeing, and Malaysia Airlines have been working on various end of flight scenarios. In a scenario involving fuel exhaustion with no control inputs, the aircraft entered a descending, spiraling low bank angle left turn and entered the water in a relatively short distance after the last engine flameout. The results of the new analyses support the search area defined in an earlier ATSB report from June 2014.